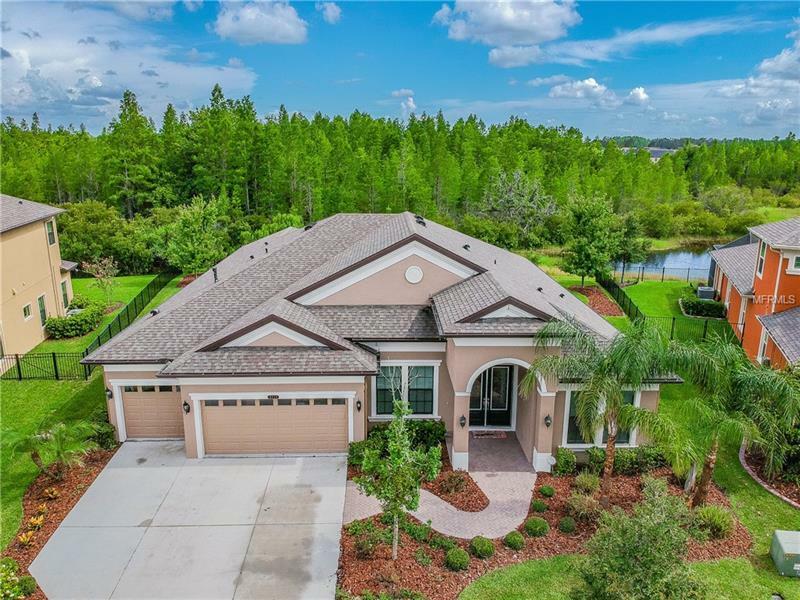 Prepare to fall in love with this Meticulously maintained 1 Story / 4 Bedroom / 3 Bathroom / Office & Bonus Room / 3 Car Garage home situated on a Wooded CONSERVATION Home site with a view of the Lake located in the highly coveted enclave of Jasmine Abby in Connerton! The Key Largoâs bright and open split floor plan built by Westbay showcases an Office/Private Den with Upgraded 8â Glass French Doors, Separate Formal Dining, Tile & Highest Quality Laminate Flooring throughout the entire house, Central Vacuum, 7-1 Surround Sound in Family Room, Bonus Room pre-wired for 5-1 Surround Sound & entire House pre-wired for Audio Speakers. GOURMET Kitchen equipped for a CHEF has an Enormous GRANITE Island with increased-depth under cabinets for additional storage, 36â GAS Cooktop and Stainless Hood with Chase Extension, 42â Cabinets with Crown Molding, Soft Close drawers, Slide out Shelves on all base cabinets, Built-in Wine Chiller & High-end STAINLESS Appliances. Ownerâs Retreat features exterior access to Lanai, Dual Walk-in Closets, Garden Tub, Walk-In Shower and Dual Sink Vanity with lowered make-up desk. Additional Extras include Tankless Gas Water Heater, Culligan Water Softener and In-the-wall Pest Control System with External Port. The exterior features Custom Curved/Paved Walkway, Large Covered Lanai with Extended Pavered Patio and Screen Enclosure. Connerton Amenities include an Exclusive Resort Style Pool, Tennis/Basketball Courts, Fitness Center, Playgrounds, Dog Park, Walking Trails and so much more!